As our nation continues to lurch and stumble its way through yet another sustained pointless political psychodrama, there are plenty of folks willing to pitch out reasons why. We do seem, as a nation, increasingly unable to get along. We posture, we bellow, we display, but what we don't really do is take one another seriously. 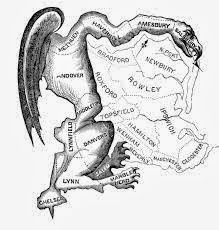 The reasons for this are many, but one that tends to come up a whole bunch is the new science of the gerrymander. Political parties who find themselves in power use this arcane art to restructure the shape of a state's districts, carefully splitting and dividing and concentrating sections of their state so that opposing parties are weakened. It's this dynamic that has lead us to a House of Representatives in which one party has a significant majority, even though its candidates received over a million fewer votes nationally. If you know how to game the system, you can insure your power. Candidates choose their voters, in other words. And that gaming is a violation of the integrity of our republic, no matter which party does it. In that concentration of power, you also insure that more extreme and combative positions aren't leavened by having to consider alternate perspectives. It radicalizes and calcifies perspectives. It makes things a mess. Musing on this the other day, I found myself noting that in some peculiar ways, this is also a problem with Christianity in the United States. The great, joyous, and glorious freedom to pursue exactly the faith community that speaks to you and your needs? The tendency of folks with Strong Theology and Big Personality to draw in folks who agree with them? It means that we divvy ourselves up, engaging in a peculiar autogerrymandering process that allows us to seek fellowship and engagement with those who are People Like Us. And because we are free, we can also choose to leave a place rather than doing the hard work of loving those who aren't People Like Us. I wouldn't have it any other way, of course. We need to be able to both seek and create communities where we feel safe and empowered. But there is a price to seeking those places of personal and theological comfort. That price comes in the ease with which we attack and condemn the other, smug and comfortable in our selected place of sameness. In its own way, that's as spiritually dangerous as being trapped in a community where you cannot freely speak. Sometimes even more so. It's hard to love your enemies if you've structured your whole life so that you never have to encounter them.